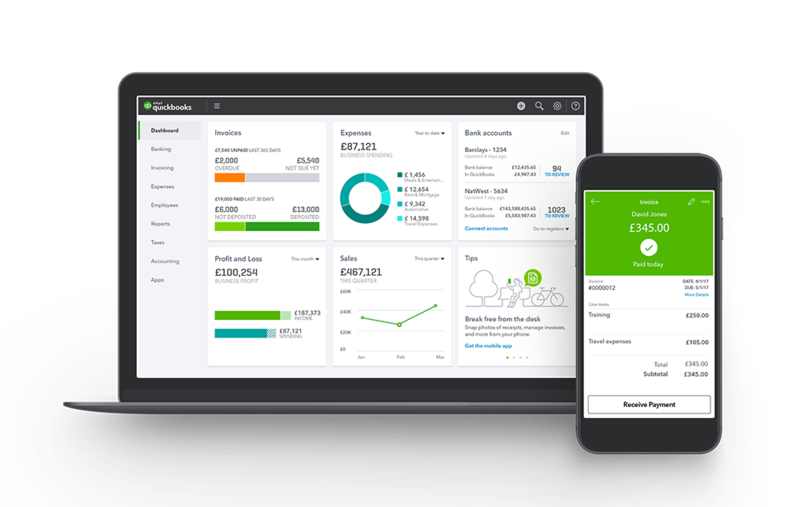 We are proud partners of QuickBooks, the world’s number 1 online accounting software. You will be assigned a member of the team who will be responsible for your ongoing business requirements, so you always have a point of contact. We offer a fixed fee pricing structure to keep things clear and allow clients to budget for their costs. An initial no obligation meeting is always available to new and existing business to discuss your needs. Accountancy needs are an ongoing process, so we feel it best to always be accessible, phone calls, emails, meetings, help and advice are always available. We are using the latest cloud technology to offer clients around the clock access to their data and information. Keeping them up to date wherever they may be. We are a small family run accountancy firm located in Cleethorpes, supplying all accountancy needs to local as well as national businesses and individuals. We supply services to start-ups and established companies and individuals ranging from Employed, Self Employed & Rental property owners. We pride ourselves on offering a personal and relaxed relationship with our clients as well as being open and available to help with any issues they may have. A combination of a free no obligation consultation to discuss your business requirements and a fixed fee pricing structure ensures there are no surprise bills. We use the latest cloud accountancy software to keep us up to date, compliant and most importantly to give clients the best possible service. With onsite secure parking clients can relax with a cup of tea. This transparency allows clients to concentrate on what is most important, running their business. Our team consists of specialists in all areas from payroll & accounts to tax planning and calculations to ensure we meet all our client’s needs. We have many years’ experience dealing with VAT, Tax Returns, CT600 returns & accounts as well as HMRC investigations to give you a reliable service to meet your expectations and beyond. Our priority is ensuring clients come first and it is this attitude to being as accessible as possible that has enabled us to have clients trusting us with their accounting needs for over 20 years. Having a human being at the end of each phone line or email address allows matters to be handled as quickly as possible as well as having a consistent point of contact. This has always been a factor in our success and longevity, our staff force has remained committed & consistent for many years allowing for strong relationships to build between staff and clients. Please feel free to get in touch, we hope to hear from you soon. “When setting up our company we were given good solid advice, regarding everything we needed to know. Invoicing, Vat and payroll etc. and have been very friendly and helpful since. “We have been with D H Tuck & Co since setting up just over 10 years ago. If I had to use three words to describe D H Tuck & Co I would use: knowledgeable, efficient, professional. “The service from D H Tuck & Co has been excellent. Very professional and quick to respond to queries. “Excellent service from a friendly & reliable accountancy practice. I always recommend D H Tuck & Co as they go above and beyond to help me and my company. Our talented team behind the scenes consist of skilled, highly motivated individuals. With years of experience and dedication to provide the best service possible we are incredibly proud of the people who make our business what it is. Please take a moment to discover the D H Tuck & Co team. David Hudson Tuck has been qualified since 1982 and founded the company in 1999. David has years of experience in tax and accountancy and is currently using that vast depth of experience to aid clients in troublesome circumstances. Dave is a family man and enjoys watching Grimsby Town accompanied by his grandson. Other interests include writing for a military history/ wargaming magazine. A Chartered Certified Accountant since 2002, and current Director. Andrew has an in-depth knowledge of Accounting and tax law. Andrew prides himself on the close working relationship with all his clients, been able to offer sound, and personalised advice to help your business for the present and the future. A keen family man, who likes nothing more than spending time with his wife and two daughters and watching sport. Jim became a member of staff at the age of 16 straight after finishing school in 2010. His work consists of managing several clients, completing accounts and ensuring that all their deadlines are met. An extensive knowledge of bookkeeping, tax calculations and accounts production allow him to be flexible to meet a client’s needs for their day to day record keeping. He has completed his AAT qualification and is currently on course to complete his Certified Qualification (ACCA) within a year. A specialist in computer & cloud-based technology ensures in formed support for those using or moving to digital platforms. Dave has been with the firm since its incorporation and has managed the wide range of changes that effect businesses and individuals every day. He has a well-rounded knowledge of accounting and his excellent communication skills gives clients a relaxed approach to their accounts. Out of work he enjoys relaxing by playing snooker and watching football. Hayley has worked at D H Tuck & Co for many years, having started on reception she has excellent communications skills and after excelling when she joined the payroll department she quickly became one of the most important members of the team. She is well versed in multiple accounting software. Currently in the final year of her AAT qualification her knowledge of accounts continues to grow, with her background in Admin and Payroll she has a host of knowledge on which to draw upon. Steve joined following the retirement of our Payroll Administrator bringing a fresh approach of payroll after gaining his Level 4 Payroll Qualification. He has a background knowledge of using cloud-based accountancy software and is the first face you will find when entering the office. Steve is currently studying for his AAT and he is always eager to learn new skills. If not at his desk he can normally be found running through a muddy field in his spare time. Kay Joined the team in 2016. Her bubbly and sociable characteristics made her an instant hit with clients and staff. A no nonsense attitude ensures the office is run effectively alongside an extensive background knowledge of Sage accounting software makes her an essential part of the day to day running here. Kay’s friendly personality personifies the firm and ensures a warm welcome into the office. Lynne has worked in the accountancy industry for over 45 years bringing a wealth of knowledge and expertise into the office. Her work ethic and experience ensure her work is always of the highest quality and produced in an efficient organised manner. Liz has a lengthy history in accounting. Her attention to detail highlights her commitment to ensuring that accounts are accurate & reliable. A willing and able member of our team, always there to offer help and advice. Feel free to give us a call, pop into the office or send us an email and we will endeavour to help you the best we can.